Retired July 31, 1954. Died March 21, 1973. 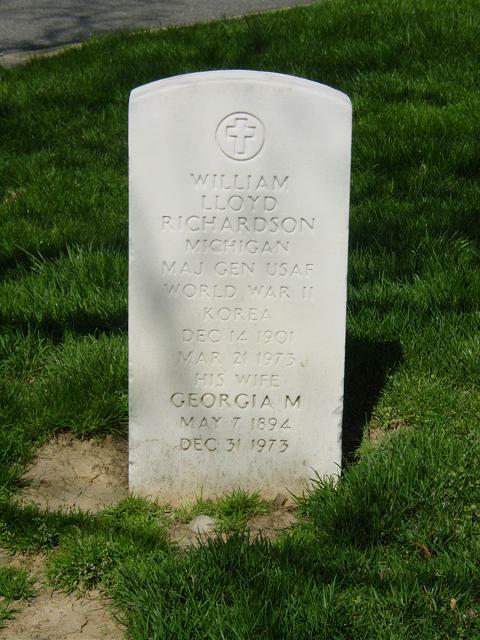 William Lloyd Richardson was born at Saginaw, Michigan, in 1901. After attending the University of Michigan for a year, he entered the U.S. Military Academy, graduated June 12, 1924, and was commissioned a Second Lieutenant in the Coast Artillery Corps. Assigned to the 63rd Coast Artillery (Anti-aircraft) at Fort Winfield Scott, California, he was given the additional duty of liaison officer with the Air Corps at Crissy Field, California. He became commanding officer of the U.S. Army mine planter "Colonel Armistead" in June 1925. A year later he joined the 15th Coast Artillery at Fort Kamehameha, Hawaii; was transferred to the 55th Coast Artillery in August 1926; and later commanded Headquarters Battery and Battery "A" there. Entering the Coast Artillery School at Fort Monroe, Virginia, in September 1930, General Richardson graduated the following June; completed the advanced gunnery course at the 51st Coast Artillery School in April 1932; and then joined the Second Coast Artillery at Fort Monroe. Detailed to the Civilian Conservation Corps in March 1933, he organized and commanded a camp at the Allegheny National Forest near Kane, Pennsylvnaia. That December he returned to Fort Monroe, where he did development work on anti-aircraft materiel and served as liaison officer with the Air Corps at Langley Field, Virginia. Ordered to the Philippine Islands in May 1936, General Richardson joined the Sixth Coast Artillery at Fort Mills and was liaison officer with the Air Corps at Nichols Field. He entered the Command and General Staff School at Fort Leavenworth, Kan., in September 1938, graduated the following June, and was assigned to the U.S. Military Academy as an instructor in tactics. Joining the War Department General staff in June 1941, he was assigned to the Planning Branch of the Operations and Training Division. Going to England in August 1942, General Richardson was assigned to the Eighth Air Force staff where he organized and trained its airdrome defense units. The following February he went to North Africa to study air defense operations, and in March 1943 returned to Fort Bliss, Texas, to organize and train the 51st Anti-Aircraft Artillery Brigade. Four months later this brigade was assigned to the Fourth Air Force, which was defending the West Coast and training Air Force units for overseas theaters. Returning to the European Theater in December 1943, General Richardson organized and trained the Ninth Air Defense Command of the Ninth Air Force, and planned the air defense operations for the continental invasion. Two years later General Richardson was named chief of the Guided Missiles Division in the Office of the Assistant Chief of the Air Staff for Operations at Army Air Force headquarters, Washington, D.C. On May 1, 1947, he was transferred to the Air Force. After the establishment of U.S. Air Force headquarters that September his division was placed under the deputy chief of staff for Operations, and in November was redesignated the Guided Missiles Group, with General Richardson retaining his position as chief. In December 1949, General Richardson became chief of the Joint Long-Range Proving Ground Group in the Office of the Deputy Chief of Staff for Materiel at Air Force headquarters. He assumed command of the Air Force division of the Joint Long Range Proving Ground at Cocoa, Florida, the following April, retaining command when it was redesignated the Long Range Proving Ground Division in May 1950, and the Air Force Missile Test Center in July 1951. His decorations include the Legion of Merit; French Legion of Honor (Chevalier) and Croix de Guerre with palm; Belgian Order of Leopold II (Commander) and Croix de Guerre with palm; and the Luxembourg Order of Adolph Nassau and Croix de Guerre.